The physical area of the Technology Design Studio deserves some admiration – it is unique, bright and spacious, which makes an ideal setting for computing and creative projects. E-Learning Technologies staff teach thier colleauges iMac basics. The space is topped by an awning-like ceiling with drop-down specialty lighting. A large L-shaped service desk sits against a support beam. Library staff members sit here, ready to assist users. Next to the desk are the Library’s daily newsstand, and a worktable outfitted with fax machine, electric hole-punch machine, electric pencil sharpener, stapler and supply container. A large multi-use copy/print/scan machine is situated nearby. Students can use the Pharos Print Station that sits next to it to pay for print jobs. The Library’s Xerox Document Center sits a few feet away. The iMac workstations are open, with low, but suitably sound-proofed, partitions. Each station has a large neutral white surface, soft but sturdy cloth walls, and smooth, rounded edges. There’s a feeling of personal-space, but the area is still open and airy. The focus of each station is the large 27-inch iMac. The white peripherals (Apple keyboard and mouse) are small and inobsrustive. Most workstations have additional power outlets. Several stand-alone workstations line the back-side of the area – three multimedia player stations sit on surfaces for students to use. The hallway behind the Technology Design Studio is home to it’s four production suites. Library users can reserve one of the rooms for audio-visual editing or presentation practice. There are two of each room style; the audiovisual suites have iMac computers while the presentation capture suites have Windows PCs. To read more about what the Technology Design Studio suites contain, click this link: http://research.auctr.edu/TDSComputers. Students tend to move chairs and furniture in the Technology Design Stuio. Luckily, all of our chairs are wheeled and easy to move. The intention of the Library is for users to have the freedom to use the space for collaboration. Students often pull up chairs to an iMac station and work collaboratively. 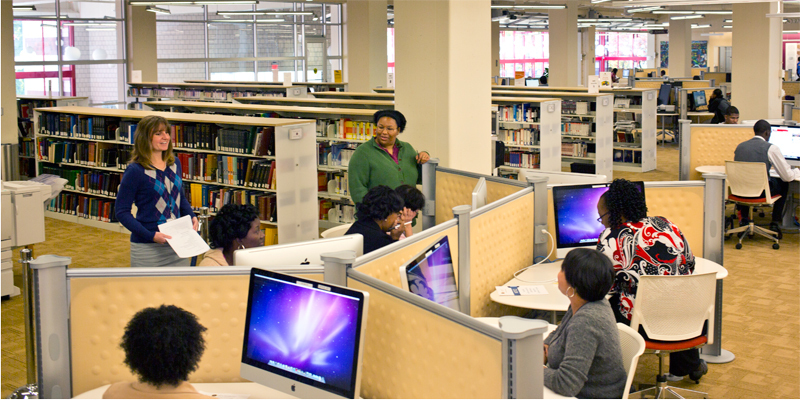 The Technology Design Studio is a popular part of the Library’s main level. We’re house-proud and rightfully so. You’re welcome to visit – come by and get a feel for our space. Its designed to be friendly, open and inviting.